Dr. Keola Donaghy is the faculty coordinator of Music Studies and the Institute of Hawaiian Music. 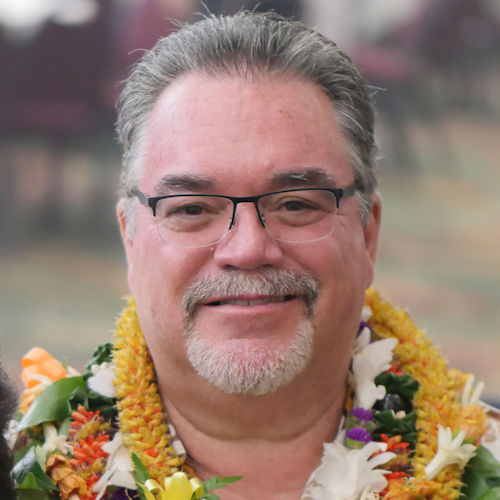 He serves on the Board of Governors of the Hawai’i Academy of Recording Arts and PBS Hawai’i. He is a prolific haku mele (composer of Hawaiian poetry/song) with over 150 compositions to his credit, and which have been recorded by Keali’i Reichel, Kenneth Makuakane, Kainani Kahaunaele, the De Lima ‘Ohana, Mailani Makainai, The Pandanus Club, Amy Hanaiali’i, and others. Keola has recording credits as not only a composer but as an instrumentalist, engineer, producer and liner note annotation. His Institute of Hawaiian Music students recorded and released “Aloha ‘Ia No ‘O Maui” in 2015. I it was honored as the Compilation Album of the Year at the 2016 Nā Hōkū Hanohano Awards, and Keola received a Nā Hōkū Hanohano Award as the release’s producer. Under his direction, both Music Studies at UH Maui College and the Institute of Hawaiian Music place equal emphasis on academic excellence, music industry engagement, and social engagement and activism though music.